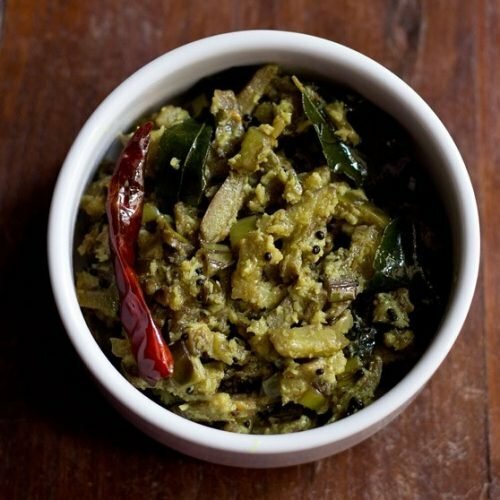 kerala style banana peel thoran is a delicious stir fried dish made with banana peels, spices and coconut. first rinse the bananas. when removing the peels, soak them in a bowl of water, so that they don't darken. you can also soak them in water in which about 1/4 tsp turmeric powder is added. slice the black dark spots from the peels if there are any and chop them finely. heat oil in a pan. first crackle the mustard seeds. add the chopped onion or shallots. saute till the onions are transparent. now add the red chili, green chili, cumin powder, asafoetida/hing, and curry leaves. saute for some seconds. add the turmeric powder and stir. add the banana peels and the coconut. if using fresh coconut, then coarsely ground the grated coconut, green chilies and cumin seeds and add it at this stage. sprinkle salt and stir. add about 1/4 or 1/2 cup water. cover the pan and let the peels cook till they are done. check in between to see the doneness and also to see if the thoran has not dried up whilst cooking. add some more water if required if the peels are still not done and cover and cook further. when the peels are cooked and if there is some moisture or water in the pan, then just dry it on low flame. serve the banana peel thoran hot with some steamed rice, accompanied with dal, sambar and rasam.